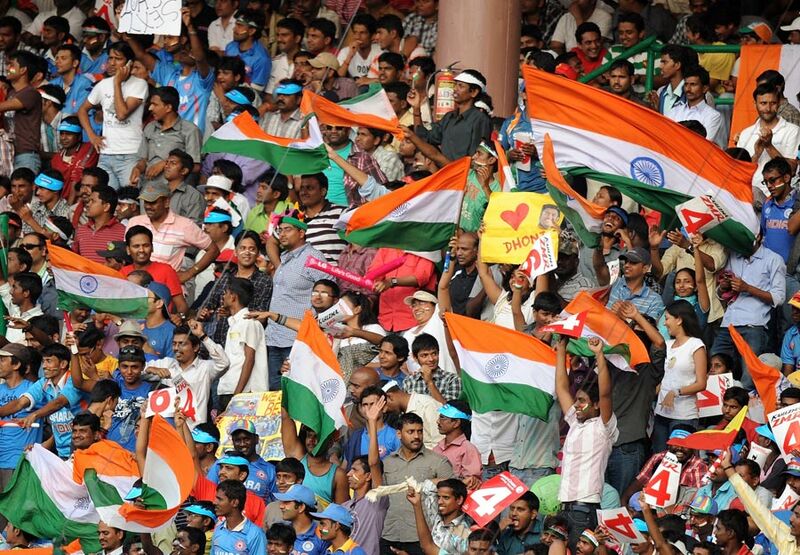 What is it with Bangalore and unforgettable World Cup games? The last one played here was fifteen years ago, and no one who watched it will ever forget the primal roar the crowd erupted in as Venkatesh Prasad sent Aamir Sohail’s off stump cartwheeling in that memorable quarter final. This one, though, was something else – two flawed sides contriving to produce the greatest World Cup game since another epic tie at Edgbaston twelve years ago. This was always going to be one of the marquee games of the tournament, and the milling crowds around the stadium more than five hours before the start certainly attested to that. Chinnaswamy Stadium has always been my favourite Indian ground for the cauldron like atmosphere its covered stands manage to produce, and well before the game began, the drumbeats and patriotic chants were underway. One chant, of course, dominated all else – and as the afternoon progressed, “SA-CHIIIIIN, SA-CHIN” pretty much continued on repeat. The great man usually seems to be playing a different game altogether, and here too, he strolled lazily to a fifty before deciding to target Graeme Swann. What will hurt the not-inconsiderable ego of England’s ace spinner the most was the nonchalant contempt with which his threat was negated, albeit by a master. And though Tendulkar’s partners looked solid enough before being dismissed, none managed to achieve the effortless change in gears Tendulkar did. Certainly Yuvraj Singh didn’t. India’s (and probably the world’s) best ODI batsman of a couple of years ago has slimmed down, but still looked to be struggling to launch any of his trademark clean hits. And the Indian crowds seem to have sensed this temerity in the Punjabi, for there was much muttering and booing directed towards him, even as he scored at more than a run a ball. He just looks ungainly, but if he’s willing to sacrifice his trademark flourish and score a few dirty runs like he did on Sunday, he will have taken the most important step towards the resurrection of his career. Aside: A gentleman in front of me held a banner with Matthew Hayden’s supposed words – “I have seen God, and he bats at no. 4 for India” – written on it. I doubt that Yuvraj Singh himself would make any claims to divinity, so I’ll just assume that the banner-holder got his cricketing formats mixed up! Back to the cricket, and Tendulkar’s exit. He’d scored a sublime 120, but with more than 10 overs left, there was plenty more for India to do. It’s interesting to observe the difference in ovations to a Tendulkar special now, compared to the 90s. A Tendulkar dismissal (after a century) invariably used to be met with disbelief, followed by panic, as the crowd knew a collapse was on the cards. On Sunday, though, such demons had long been put to rest, and 40,000 people stood up to give a heartfelt and emotional ovation to the man, secure in the knowledge that Dhoni and Pathan were just warming up. Not that either of them got anywhere right at the end. Tim Bresnan was fast and accurate, and his effort on Sunday has to be seen in even sharper relief, considering that he possibly slashed 15 runs from the India total. But at that point, the crowd was none too disappointed, and why would they be? 339, in a World Cup game, under lights, against the tournament favourites? We all knew that was never going to happen. So I was secure enough in my swagger, and so was the crowd in the Kolkata Stand, as 5,000 Indian supporters good-naturely taunted the three Englishmen in their midst. I’d stood in line with one of them before the game, and asked him which of two results he expected – an Indian win by less than 80 runs, or more than 80 runs (or 7 wickets)? He gamely assured me that this one was going to be tight, only to be laughed off. And even as Andrew Strauss and Kevin Pietersen raced off the blocks, someone in the stands suggested to the three Englishmen what we all thought – “Enjoy it while it lasts, boys!”. England were grimly determined to reach their target, but up in the stands, we thought 338 was insurmountable. And so the banter continued – “England has WAGs, we have SehWAG”, to give a sophisticated example. But you can always sense that a game is getting uncomfortably close when the banter ceases, and creases begin to line the faces in the crowd. At 130/2, a few started muttering about how India were “worse than Holland”. AT 200/2, it was officially time to panic, and suddenly, you could hear the voices of the three Englishmen quite clearly. When the Indian review against Ian Bell failed, the frustration in the crowd boiled over, as chants of “CHEATING, CHEATING” filled the air. Unfair as the chants were, the crowd had to find a scapegoat for the hiding India were receiving at the hands of Bell and Strauss. Booing the England captain was out of the question, for the fiercely partisan Chinnaswamy crowd is still appreciative enough of a truly majestic innings. Strauss’ innings belongs in the very top drawer of ODI centuries – possibly the best ever by an Englishman in this format. He seems to relish having Pietersen as an opening partner, as he can play his game unobtrusively and at a faster scoring pace than his partner, even as Pietersen takes all the limelight. Tendulkar’s innings was an effervescent delight, but Strauss’ was the superior knock, a captain’s innings of guts, determination and eerie calm as England remorselessly chased down 339. But I do believe this Indian team is different from its forebears in one major aspect – it simply does not know when it’s beaten, in any format of the game. Zaheer Khan was MS Dhoni’s last gamble, and when he yorked Strauss out, the stadium roof must have been in serious danger of being blown clean through. More wickets were met with more pandemonium – increasingly tinged with relief and even a bit of swagger. It was fascinating to see the English supporters’ faces in the crowd, as they lurched from jubilation to worry to plain ashen-faced horror. Then, of course, came those sixes from the tailenders, most memorably Shehzad’s first ball effort, one which seemed to have sucked the oxygen out of Bangalore. So when Yusuf Pathan fielded cleanly to prevent the winning run, believe me when I say that the universal emotion running through both English and Indian supporters was one of relief. It would have been gut-wrenching to lose a game like this, and it would have been unfair on either side, both of whom did their part in scripting a classic for the ages. I know it’s easy to carp in the cold light of day, and fret over the missed opportunities for both sides. But the carping ignores the fact that a great sporting contest needs drama, and drama, more often than not, takes the form of elite sportsmen suddenly playing like schoolboys. I’d love to be critical and worry about India’s glaring deficiencies, but I can’t, for two days later, I’m still walking around with a beatific smile, secure in the knowledge that I had been a witness to history. And despite being wholly partisan in this one, I’m thrilled that it was a tie, for it just feels right to not have had a loser in this contest. Just so that 40,000 people could go home happy, but so could the three Englishmen, one of whom no doubt telling the others about the cocky Indian fan he’d met, and the comeuppance he received. Though I’m not a big fan of Yuvi, I did feel though that he was middling the ball from get-go, and looked alright. Of course, he was not anywhere close to Sachin’s league , but he did seem relatively comfortable by his own recent standards. Of course, with every single team and player seemingly scoring 300+ and 50+ respectively at will, it remains to be seen if Yuvraj has hit any sort of a rhythm yet or not. Enjoyed the read – the cauldron-like atmosphere of Chinnaswamy is something really worth experiencing. And respect to the 3 English fans, who were copping it from many. One of the better match reports I’ve read on the game ! Top stuff mate. Initially when comparisons were made to the Aus – S Af game in 99 I laughed it off. That game was the greatest ODI ever. There wasn’t any ineptness on show, and was between two teams – one at their peak ( S Af) and Aus ( almost there but not quite). However, thinking about this game in a bit more depth – it did have it’s magical moments – the two 100’s, Bresnan’s bowling, Zaheer’s third spell, and of course the tonking of Swann and Anderson. But the niggle that this was a game that both sides tried hard to lose , doesn’t allow me to say it was a proper classic like the 99 game. Oh well, that’s my take anyway..
Cracking read Rajesh, top stiff. Ahem… top stuff I meant! Wonderful stuff Rajesh. You’ll always be able to say that you were there! Great post, RK ! I am in Blr now, and spoke with a couple of friends who’ve been there.You have captured the unspoken emotions of thousands of the fans. Thanks ! Wonderful read! Far better than any newspaper article I’ve read on the game. How come you’re not writing more on here? More posts would be very welcome by all, I’m sure. BP – we’re always privileged when Rajesh writes at 99.94. If you haven’t already, dig back into his previous work and you’ll see what I mean. I enjoyed reading every bit of it. I mean all the viewers were actually going through the same feelings.